Toronto-based Morgan Solar, maker of a new type of concentrated solar PV system based on light-guiding optics, has upped its first round financing to $8.2 million from $4.7 million after attracting the dollars of two Canadian venture-capital groups. Tom Rand at VCi Green Fund in Toronto led a Canadian investor consortium that contributed $2.3 million. It wasn’t a problem finding interest, he told me today. “I just reached into my network and within days it was filled up.” Another group took on $1.2 million, but the investors behind it were not disclosed. Rand said he visited a thousand or so booths at the Solar Power International show in Anaheim in October and found Morgan Solar to be the only company offering a non-commodity solar play. “It was the only one that had something significantly different,” he said. “Someone finally asked, why are we using lenses, which is a technology from the last century. We know how to guide light now, so let’s guide light.” Rand added that Morgan Solar has the potential to disrupt the industry on price. “The question is whether they can meet demand” if they can get to that magic price point. Since first writing about Toronto-based Morgan Solar a year ago, I’ve grown increasingly fond of this up-and-coming developer and soon-to-be manufacturer of concentrated PV systems. They think out-of-the-box, and they execute quickly. They fine tune until they get it right, and they don’t make a lot of noise until they get it right. They’re creative and original, and as a result stand out from others in the field. So when I got a call from biz-dev director Nicolas Morgan telling me the company had secured $4.7 million in financing and that Spanish utility Iberdrola Group signed on a strategic investor, I guess I wasn’t surprised. Click here to learn more about the latest news from Morgan Solar, and its plans to get a commercial production line up and running in Toronto sometime in 2010. Also click here for an MIT Technology Review article about the company’s innovative technology. I’ve written about this Toronto-based solar concentrator company recently, but the Morgan boys have since been busy improving their design and, I must say, it’s pretty cool. Check this MIT Technology Review article on Morgan Solar for an update. What’s changed, basically, is how the company’s Light-Guide Solar Optic is packaged. The original design had two triangular acrylic optics packaged as a square. Each triangle captured, directed and concentrated light to a single corner where a tiny solar cell was positioned. The new design is a full square that directs light to the centre where it is concentrated in a secondary glass optic. In this secondary optic, concentrated light is bent at a 90-degree angle and hits a small cell bonded to the bottom. The effect is essentially the same, but the new design lowers the quantity of materials, reduces steps in the manufacturing process and, as a result, means lower manufacturing costs. 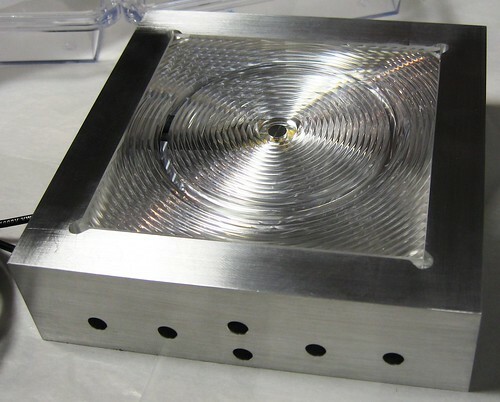 The end result is the lowest-profile solar concentrator I’ve seen that has commercial potential.